Figure 1. Falling Window pattern. Remark: in particular cases the pattern may act as a bearish reversal pattern if prior its occurrence market was in an uptrend. This article is devoted to the Falling Window two-line pattern. The Falling Window is classified as a bearish continuation pattern. Both pattern's lines can be any basic candles, appearing either as a long or as a short line. The only exception is the Four-Price Doji, which cannot appear as a part of the pattern. The pattern is characterized by a price gap appearing between the first candle's low and the second candle's high. Windows are known in western technical analysis and often are called as gaps. Japanese are very particular about windows claiming that the trend will be continued until the gap is not closed. Shimizu mentions that in Japan they also call gaps as holes. Morris is not regarding windows as patterns which seem to be strange. Namely he is not doing the same with such patterns as Kicking Up/Kicking Down, Two-Candle Shooting Star/Inverted Hammer or others, where price gap is also required. In CandleScanner we consider windows as patterns. Nison and Bulkowski find windows as patterns too, but note that Bulkowski's interpretation is somewhat different to ours (see Rising Window for more details). Nison mentions that windows are among the most important candlestick patterns. In our interpretation, for the Falling Window, it is enough that the first candle's closing price is located below the trendline, whereas the opening price may be placed above. The assumption that the Falling Window pattern requires a few candles in a downtrend, prior its occurrence, may lead to losing very significant signals. Particular attention should be paid to the second candle of the pattern, which may be a part of other, conflicting pattern, i.e. being a bullish pattern. In such unclear situations, attention should be focused on the overall market context and the resistance/support lines. Figure 2. A (1) Falling Window confirms a downtrend. Its second line, a Long Black Candle, formed at high trading volume, creates a strong resistance zone for the bulls in the future. Note that the Long Black Candle looks on the chart as if it would be an Opening Black Marubozu basic candle because the upper shadow is hardly visible (its length is only $0.01). It is clearly visible how the Long Black Candle works as a resistance area on the following candles. A (2) Falling Window is a consequence of the market weakness on which the bulls have a problem to move prices higher. In the case of the Falling Window, every gap creates a resistance zone. A (1) White Candle failed to close the (2) Falling Window's gap and price drops even deeper. In the case of the (3) Falling Window, the situation is very similar to its previous occurrence, i.e. (2) White Candle cannot close the gap. 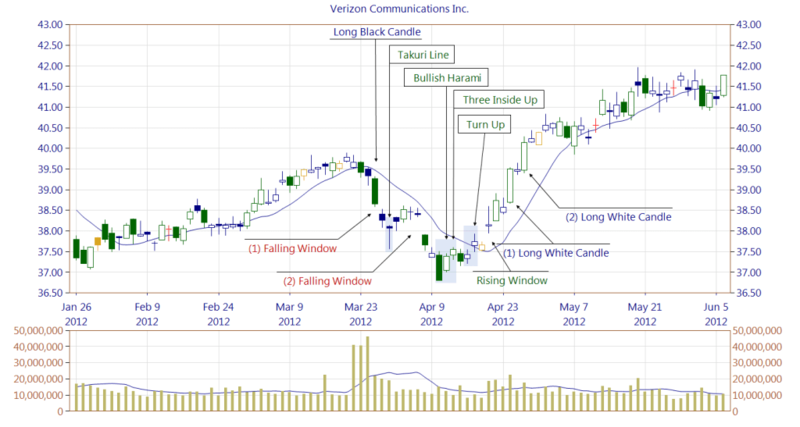 A Black Candle occurrence confirms the downtrend and yet another (4) Falling Window is formed. Figure 3. A Long Black Candle, being the first line of the (1) Falling Window confirms a trend reversal. On top of that there is an increased trading volume. In such context a Takuri Line bullish reversal pattern appears. In order to confirm the Takuri Line, the market would have to break out upward to start an uptrend. It is not that easy, however, due to the price gap formed by the Falling Window pattern. The occurrence of the (2) Falling Window confirms continuation of the downtrend for a while. Then a Bullish Harami pattern appears (note that its second line is quite long). The following candle forms a Three Inside Up pattern, however, it is not confirmed because of the price gap of the (2) Falling Window. The bulls, however, keep trying, and a Turn Up pattern is formed. It is confirmed immediately by the second line of a Rising Window. (1) Long White Candle formed at a high trading volume breaks out of the resistance zone (Long Black Candle) allowing the market to move upward. (2) Long White Candle appearance breaks out of another resistance area formed by the previous chart peak prior the Long Black Candle occurrence. Two occurrences of the Long White Candle will act as a support in the future. 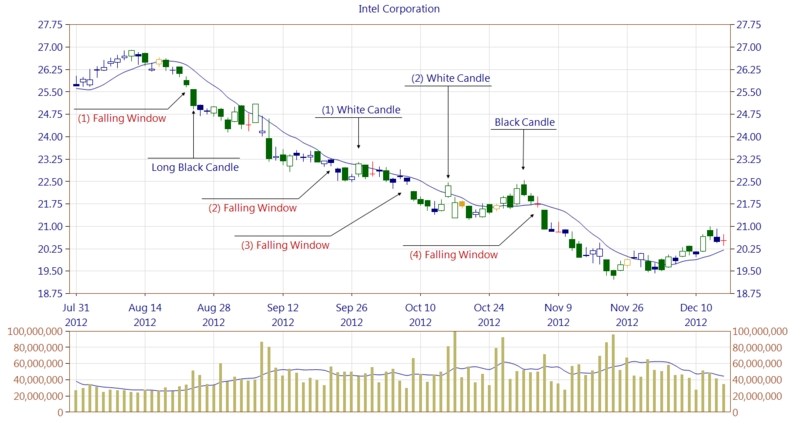 Below you can find some Falling Window pattern statistics calculated by CandleScanner software. 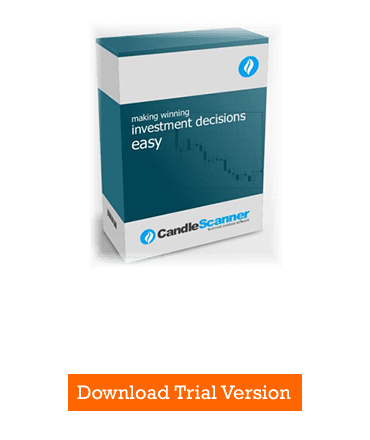 To see more detailed statistics, for other markets and periodicity try our CandleScanner software. Prices start at only $10, and you can see more detailed statistics, for other markets and periodicity. Click here to find out more!